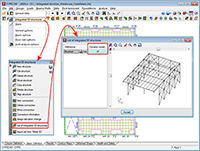 CYPECAD contains a software tool which allows for a dynamic analysis to be carried out on buildings with seismic loads acting upon them, which includes the effects of the non-structural construction elements used in the façades and partitions of the building, and considers various behavioural models of the building corresponding to different situations or states of these elements. 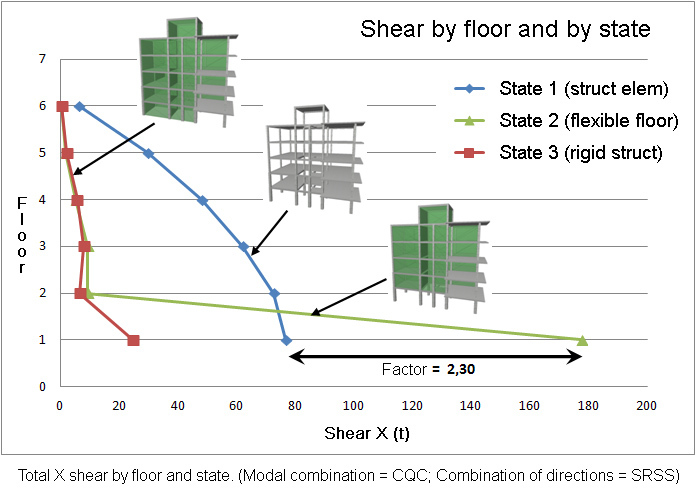 The façades and partitions of the building are considered as being “non-structural” elements, however, during an earthquake, they do provide stiffness to the structure, hence modifying the distribution and magnitude of the forces caused by the seismic action For example, when there is a non-uniform distribution between floors of the stiffness associated with the partitions, the horizontal forces have a greater impact on the columns belonging to the floors with less stiffness, producing shear forces of a high magnitude in the columns. If these have not been designed accordingly, the forces can cause a fragile fracture, endangering the stability of the building, even leading to its collapse. This is the case of buildings, whose ground floor is destined to be used as retail precincts, and are, generally, irregularly stiff, causing them to be weaker at that floor. The difference in stiffness is due to the height of that floor usually being higher than that of the other floors, and that, due to the use of the floor, is an open floor. Even if the floor below were to have a similar stiffness to that of those above, during the first instants of the earthquake, the partitions of the lower parts of the building fracture, causing an abrupt change in the stiffness, and therefore, an irregularity similar to that described previously. Hence, the stiffness provided by the different non-structural elements can change during the seismic action, due to the cracks and fractures which appear successively. This module has been developed by CYPE, with the collaboration of the Centro Internacional de Métodos Numéricos en Ingeniería (CIMNE) of the Universidad Politécnica de Cataluña (UPC), financed by the Centro para el Desarrollo Tecnológico Industrial (CDTI) and co-financed by the European Regional Development Fund (ERDF). There are currently no software tools available on the market for the structural analysis of buildings which integrate the possibility of considering, in a simple manner, the façades and partitions, even though it has been proved that they directly affect the stability, stiffness and safety of the building during an earthquake. 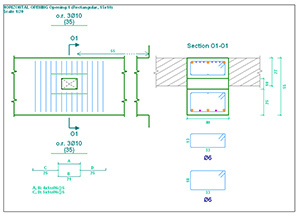 Since this CYPECAD module does integrate them, keeping the computation periods within an admissible period, their integration in the building projects will increase their quality and the safety of their occupants, allowing for unfortunate losses, both material and human, to be avoided after an earthquake. More information can be found on the Interaction of the structure with the construction elements webpage. Règles techniques de conception et de calcul de ouvrages et constructions en béton armé suivant la method des états limites. This code was implemented in CYPE programs in the 2009.1.a version. 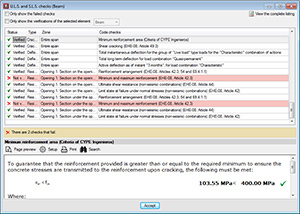 In the 2013.b version, a group of codes were included which allowed for the Advanced column editor of CYPECAD to be used (which, besides permitting users to use the advanced column editor, also allowed for the Detailed Ultimate Limit State reports and automatic reinforcement tables to be generated). Règles de Construction Parasismique – Règles PS applicable aux bâtiments – PS 92. Règles de Construction Parasismique – Règles PS applicable aux bâtiments – PS 92 (version révisée 2010). Additionally, the U.L.S. reports for columns and beams that are generated by the advanced beam and column editors, include reinforcement ductility criteria and the capacity design criteria for seismic design (bending and shear for the seismic design of concrete supports, and capacity design criteria for shear for the seismic design of concrete beams) indicated in each of the aforementioned codes. South African National Standard. The structural use of steel. Part 2: Cold-formed steel structures. Implemented in CYPECAD, Metal 3D and Portal frame generator for basic cold-formed sections. 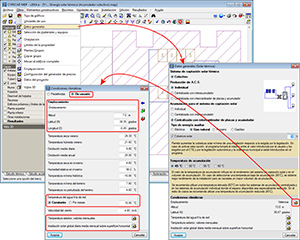 When analysing with CYPECAD, if users select the French BAEL 91 (R-99) code and combine it with any of the indicated seismic loads, the program will take into account the reinforcement ductility criteria and the capacity design criteria for seismic design of the selected seismic code. 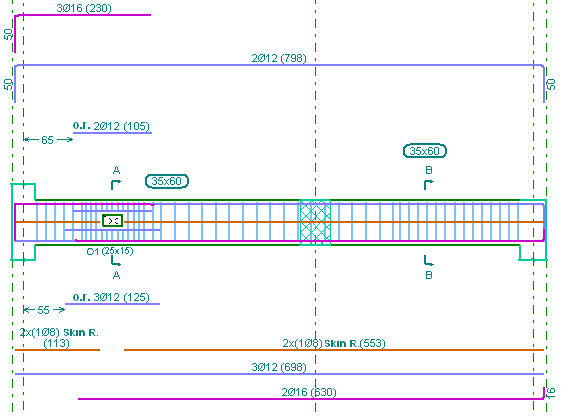 These criteria are justified in the detailed Ultimate Limit State reports generated by the Advanced column and beam editors of CYPECAD. More information on the combined use of the BAEL 91 (R-99) code with the indicated seismic codes can be found in the BAEL 91 (R-99) (France) section. More information can be found in the New modules section on this webpage. 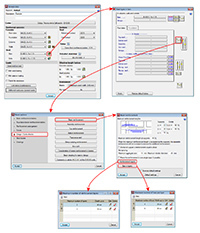 A new section, Degrees of freedom which intervene in the analysis, has been implemented in the seismic parameters dialogue box of each dynamic seismic analysis code – modal spectral analysis – (Job > General data > Select with seismic loading option > select seismic code). Users are also informed here of the option which performs the same operation for the Integrated 3D structures of CYPECAD. The height of the horizontal opening must be less than one third of the depth of the beam. The length of the horizontal opening must be less than the depth of the beam. The position of the horizontal opening must guarantee that the cover is respected in all the faces of the opening, and in the top and bottom surfaces of the beam. The free distance between consecutive horizontal openings must be greater than two times the depth of the beam. The free distance between a horizontal opening and the supporting side of the beam must be greater than half of its depth. No horizontal openings may be introduced in the confinement zones established by the seismic code. The interaction between the reinforcement of the openings and the rest of the reinforcement introduced by users is completely automatic. When users introduce an opening, the program cuts the skin reinforcement bar at the opening, reorganises the stirrups on which the opening lies, and, if it is displaced, the reinforcement of the frame is modified in accordance. The program checks that the horizontal openings only cut the skin reinforcement bars. If this is not the case, an error message is displayed. 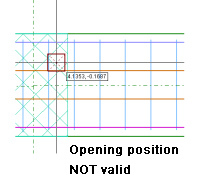 The conditions under which an opening is considered to be correctly defined may vary along the length of the frame (for example, if another opening is introduced very close to it, the stirrups of both openings could overlap, which would generate an undefined situation). If an opening cannot be processed, it is marked with a red dot and an error message is displayed when the mouse cursor is placed over it; and its effects on the previously introduced reinforcement disappear until the opening is deleted or the error is resolved. 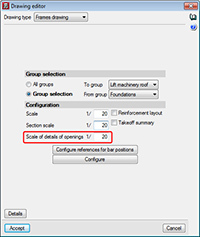 The options to define the openings are located in the Openings floating menu, which can be activated by selecting the button, that appears in the top buttons bar next to the transverse reinforcement edition option. Once the New opening button ( ) is selected, the New opening dialogue appears on screen, in which the type of opening (Rectangular or Circular) and its dimensions are defined. To confirm the position of the opening, simply click on the left mouse button so a panel appears allowing for the numerical position of the opening to be defined. Anchorage of bars that are cut due to the interaction with the opening (only affects skin reinforcement bars). The Length of lateral confinement, which is required in the dialogue box in which the reinforcement of the opening is defined, refers to the zones at either side of the opening. The same stirrup arrangement is used in both zones defined by the lateral confinement length as before the opening was introduced, but with the stirrup diameter and spacing defined for the opening. These zones are used to guarantee the shear is transmitted correctly between the zone of the beam without an opening and the zone with. Two independent stirrup arrangements can be defined for the parts above and below the opening, and the template of the opening (indicates the points which can tie the stirrups or cross-ties) must be compatible with the base reinforcement template of the span in which it is located (to avoid there being loose stirrups). The number of reinforcement bars of the opening must be greater than or equal to the number of reinforcement bars of the template to guarantee there is a bar at all the positions at which the stirrups are held. This option displays the same dialogue in which the reinforcement of the opening has been defined using the New opening ( ) option. ( button on the top bar of the beam editor > Edit). This way a panel is displayed which allows users to edit the reinforcement of the opening. ( button on the top bar of the beam editor > Edit). Allows users to edit the transverse reinforcement of the opening, the additional reinforcement and anchorage. Allows users to match the type of opening and their reinforcement to several openings. First of all, users must select the opening which is to be taken as the source opening (which will allow for any parameters to be edited) and then, select the openings to be matched. This selection can be carried out one-by-one, or using a capture window. Those which are the same are displayed in orange and those that are different in yellow. Allows users to displace the opening within the same span. Simply select the opening and drag it to its new position. When the opening is placed in its new position, the program applies the same considerations as when a new opening is introduced. Users can delete the selected opening or openings. Multiple openings can be selected for deletion (using a capture window), or deleted individually. The U.L.S. 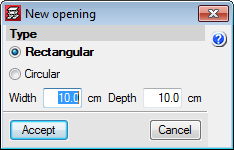 checks of the introduced openings can be consulted using the existing options in the beam editor, (U.L.S. checks at the worst case point) and (U.L.S. checks at a point) buttons. In the case of the worst case point, all the checks of the openings the beam may have are added to the checks of the beam. When consulting the checks at a point, the opening can be selected directly. 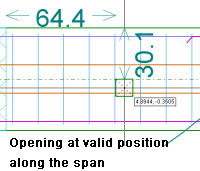 When checking a beam with openings, worst case checks of the beam may appear in the zone in which the opening is situated because the program considers that the zone of the opening should meet the requirements of the section with the opening as well as the section without it. An element filter has been implemented to help when consulting the checks of the openings using the worst case point option ( ). For beams without openings, the panel has exactly the same appearance as it did before. If a frame contains openings, the details of the opening are automatically generated integrated within the details of each frame. The scale of the detail of the opening can be configured by users. Two new options: Reinforcement layers and Bars in layers, have been implemented in the Beam reinforcement dialogue box (Job > General data > By position button > Beam options > Design/ Code checks > Beam reinforcement – see image). 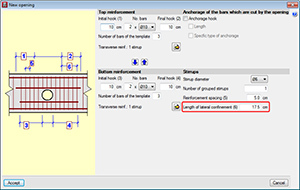 These options allow users to distribute the beam reinforcement in different layers. Users can create a table indicating the maximum number of layers depending on the depth of the beam. Users can create a table indicating the maximum number of bars depending on the width of the beam. 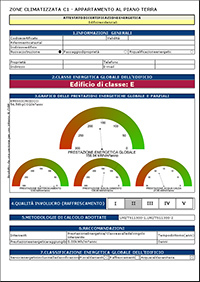 The 2014.a version of CYPECAD MEP for Italy can generate a document containing the national Energy performance certificate model (Attestato di certificazione energetica) (Studio termico > File > Stampare > Relazioni del progetto > Attestato di certificazione energetica). To do so, the design of the installation has been adapted so it is valid for any latitude. 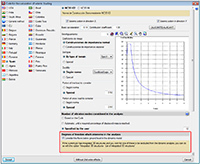 For all the countries for which the solar thermal design is available, the climate data of the location of the building can now be edited from the Solar thermal tab (including the monthly values of the External temperature and Monthly daily average solar irradiation over horizontal surface). In previous versions (for Spain and Portugal), the climate data could only be edited from the Thermal study and Air conditioning tabs.